Tempeh, or tempe in Indonesian, is made by a natural culturing and controlled fermentation process that binds soybeans into a cake form. 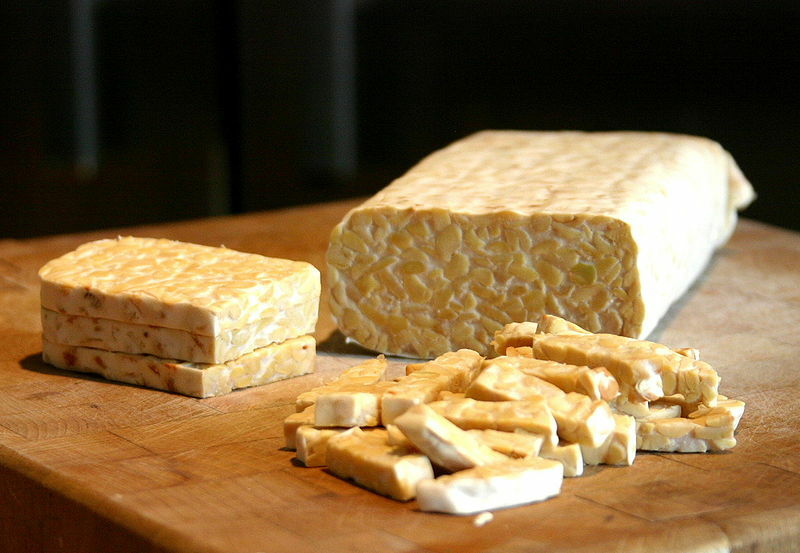 Tempeh is unique among major traditional soyfoods in that it is the only one that did not originate in China or Japan. Left: Fresh tempeh at the market, Jakarta, Indonesia. It originated in today's Indonesia, and especially popular on the island of Java, where it is a staple source of protein. Like tofu, tempeh is made from soybeans, but tempeh is a whole soybean product with different nutritional characteristics and textural qualities. Tempeh's fermentation process and its retention of the whole bean give it a higher content of protein, dietary fiber, and vitamins compared to tofu, as well as firmer texture and stronger flavor. Because of its nutritional value, tempeh is used worldwide in vegetarian cuisine; some consider it to be a meat analogue. A mild acidulent, usually vinegar, may be added in order to lower the pH and create a selective environment that favors the growth of the tempeh mold over competitors. A fermentation starter containing the spores of fungus Rhizopus oligosporus is mixed in. The beans are spread into a thin layer and are allowed to ferment for 24 to 36 hours at a temperature around 30°C (86°F). In good tempeh, the beans are knitted together by a mat of white mycelia (the vegetative part of a fungus). A mild ammonia smell may accompany good tempeh as it ferments, but it should not be overpowering. 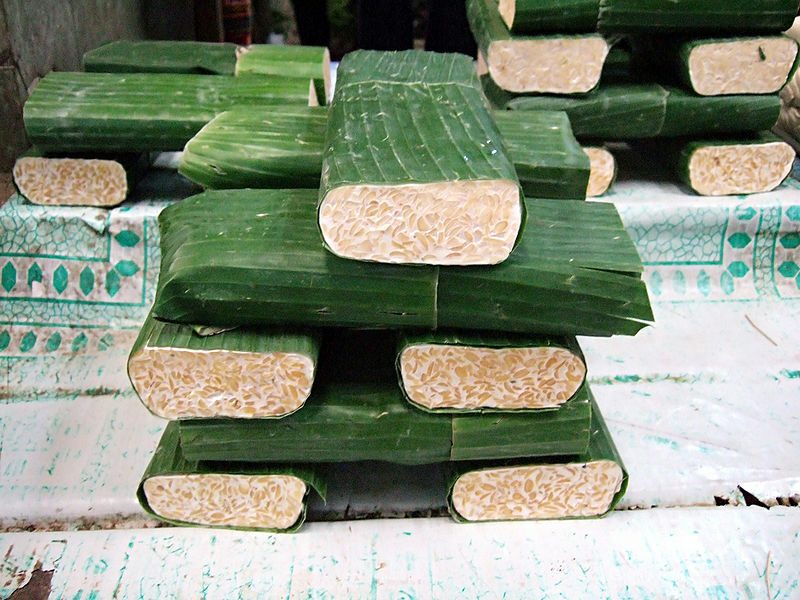 In Indonesia, ripe tempeh (two or more days old) is considered a delicacy. In the kitchen, tempeh is often prepared by cutting it into pieces, soaking in brine or salty sauce, and then frying. Cooked tempeh can be eaten alone, or used in chili, stir frys, soups, salads, sandwiches, and stews. Recent popular vegan cookbooks have come up with more creative ways of cooking tempeh, using it as a vegetarian substitution for breakfast meats, such as sausage and bacon. Tempeh has a complex flavor that has been described as nutty, meaty, and mushroom-like. Tempeh freezes well, and is now commonly available in many western supermarkets as well as in ethnic markets and health food stores. Tempeh performs well in a cheese grater, after which it may be used in the place of ground beef (as in tacos). When thin sliced and deep fried in oil, tempeh obtains a crispy golden crust while maintaining a soft interior—its sponge-like consistency make it suitable for marinades. Dried tempeh (whether cooked or raw) provides an excellent stew base for backpackers. 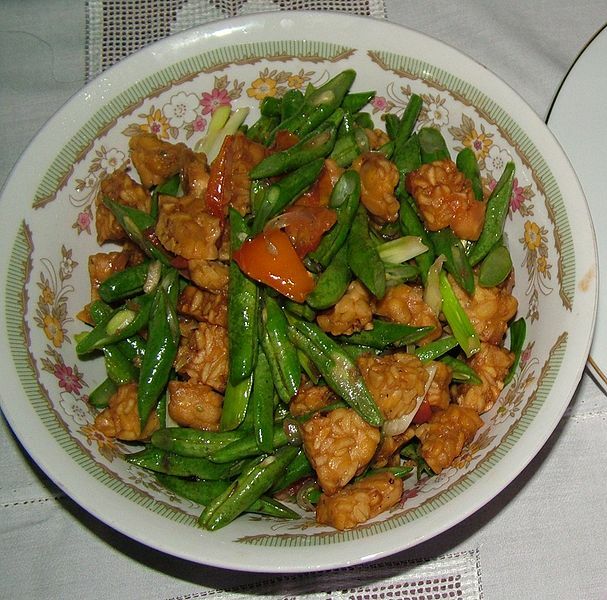 Left: Sautéed tempeh with green beans, an Indonesian dish.